The Gundermen play a specialist role in the Hyborian Age. They are mentioned in some of the Conan stories with certain skills in the military realm, namely as the best infantry of the period. Gunderland is a distinct area of Aquilonia nestled in the northwestern corner of that realm. What is it that makes Gunderland different? One possibility is it is a plateau or area of highlands that differentiates itself from the main portion of Aquilonia. The Gundermen are related to the Aquilonians proper but with distinctive characteristics. As mentioned by Howard, they are the closest thing to a pure-blooded Hyborian in Conan’s time. Why are the Gundermen still fairly pure-blooded? Howard mentions they keep no slaves. “Notes on Various Peoples of the Hyborian Age” mentions the Aquilonians modified in the south by admixture with the Zingarans and in the west and north with the Bossonians. There are also an “aboriginal” people absorbed into the surrounding population. These of course are remnants of the Empire of Acheron. Interesting that Howard mentions the Aquilonians absorbing Bossonian blood in the north. That means the Gundermen were originally cut off from the Hyborians who became the Aquilonians. For whatever reason, the tribe who became settled or more likely conquered Gunderland did not absorb any native peoples. The area might not have been inhabited by any people– an unlikely possibility. Another scenario is the area was depopulated with the fall of Acheron. The Gundermen might have put most of the original population to the sword with remnants fleeing at refugees. The Cimmerians might have exterminated the Acheronians and then withdrawn back into their hills leaving the area ripe for settlement. Howard mentions the Gundermen keep no slaves. That means there are no large plantations or estates present. They also fight on foot. What can be gathered from this is the Gundermen did not undergo feudalism like the other Hyborians. The Gundermen have a tendency to wander so that means things are not that great back home to keep them on the farm. “The Scarlet Citadel” mentions them arriving to battle along with the Bossonians on “tough swift ponies.” Gunderland is not cavalry country. The Gundermen are described as wearing steel caps. A key statement in HofD mentions the Gundermen using overlapping shields to protect themselves from arrows. Howard’s use of the word spear is for a reason. You can use a large shield with a thrusting spear about 7-9 feet long. Pikes are more in the 15-18 feet long area and need to be used with both arms. 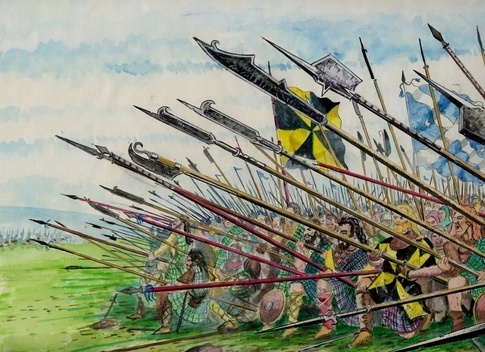 The Macedonians used the 16 foot long sarissa that required both arms. King Philip lightened the armor and had the pikeman use a small buckler that generally hung from the neck. The Swiss pikemen also did not use much armor in order to maintain speed and they didn’t use shields. This means the Gundermen fought with thrusting spears around 8 feet long and wore shields. A pike is generally held underhand. A shorter thrusting spear can be used overhand or underhand. There is more biomechanical strength using it overhand than underhand with one hand. Spears are cheaper to manufacture than swords. Throughout history, you generally don’t have throwing spears dominating the battlefield. First, throwing a weapon that can miss and then be used against you is a factor. There have been specialist javelin throwers such as the Agrianians in Alexander the Great’s army. Javelin throwers are generally light infantry for skirmishing such as the peltasts in ancient Greece. Chaka Zulu found more damage could be done with a short thrusting spear than the flimsy throwing spears the Bantu had used. The Gundermen are fighting as a shield wall or similar to the Greek phalanx. Howard also mentions some axes rising above the knight’s head while spear thrusts from underneath. 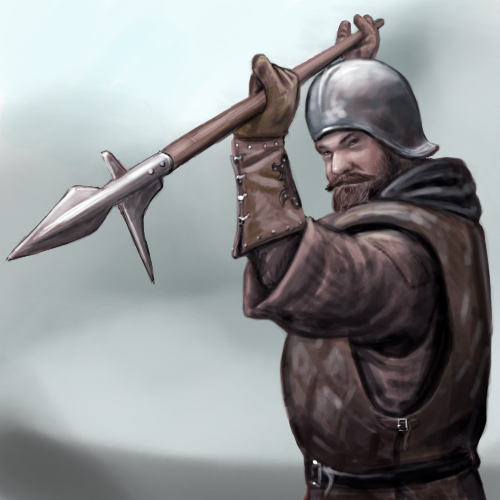 The Gundermen are also using a long handled axe, bill, or halberd for dealing with the plate armor on mounted knights. Generally any infantry fighting in a shield wall also uses a short sword in addition though Howard never mentions any. There is no doubt that the Gundermen are a force that can buzz-saw through opposing infantry as in “The Scarlet Citadel.” Howard does not mention the armor that the Gundermen used. It could have been a motley collection of mail, scale, and leather. If there is a historical people that comes to mind as being like the Gundermen, it is the Anglo-Saxons. The English fought on foot and conquered most of Britain using spears as the main weapon. They fought in a shield wall whether against Celts, Vikings, or Normans. They took up the long handled axe from the Danes using them at Hastings. The bill was a favorite English weapon for centuries and was effective in cutting down Scots or French knights. 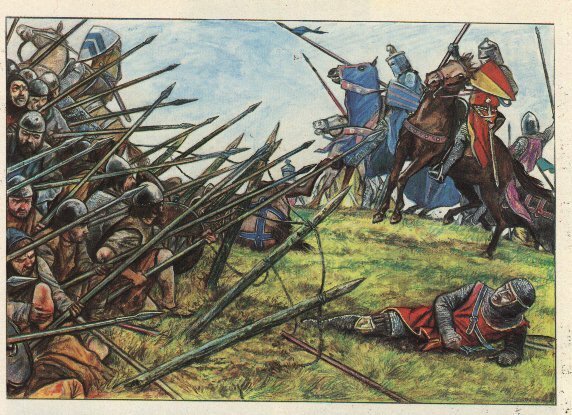 In a recent interview, Bernard Cornwell mentioned that most of the killing done at the Battle of Agincourt was the close fighting and not the arrow storms. The English also wandered into foreign armies after the Norman Conquest. The famed Varangian Guard in the Byzantine Army was made mostly of Englishmen after Hastings. The Gundermen are part of an integrated force that included the Bossonian archers, and the Aquilonian cavalry. Together they form an army unequalled in the Hyborian Age. The Gunderland continued as an independent region after the fall of the Aquilonia to the Picts. They are destroyed by the Cimmerian migration caused the ice age commencing. The Cimmerians fought more as a light to medium infantry. One imagines Cimmerian swordsmen getting under the Gundermen pikes and cutting them down in windrows as the Romans later did to the Macedonians and the Spanish sword and buckler men did to the Swiss. If I remember my Howard correctly it was the treacherous slaughter of the Bossonians by the Aquilonians themselves that led to the Pictish conquest. The Picts also fought as light to medium infantry – they probably decided to leave the Gundermen alone during/after the conquest. Or maybe the Picts weren’t as desperate as the Cimmerians were when they attacked. A really good look at the Gunderman. I thought the Acheron had some remnant down in Stygia. I need to re read the REH stories again.